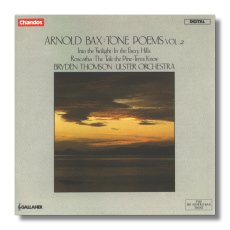 In his time, regarded as a major British symphonist, Arnold Edward Trevor Bax (November 8, 1883 - October 3, 1953) also led the life of a poet and playwright. He studied at the Royal Academy of Music, winning both composition prizes and a reputation as a legendary pianist. Among his other skills, he could reduce complex orchestral scores to the piano at sight. In his early years, Bax from time to time accompanied musicians and in this capacity won the admiration of both Arnold Schoenberg and Claude Debussy. However, he had no interest in pursuing a virtuoso career. In the early 1900s, he became infatuated with Ireland and the Celtic Twilight literary movement, represented most strongly by Yeats. The west of Ireland became one of his favorite places, and he visited there again and again. 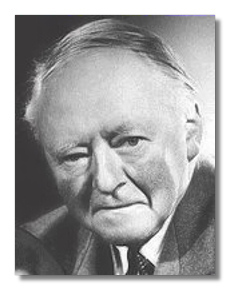 He began to publish poems, plays, and stories with Irish themes under the name Dermot O'Byrne. Around 1910, Bax also became fascinated with Russian music through a trip there and through the London performances of the Ballets Russes and composed pastiches of Russian music, mainly for piano. The First World War probably affected Bax less than the Irish Troubles of the same time. Indeed, the British censor banned a collection of his poetry because of its strong pro-Irish stance. His major scores of the period – Spring Fire, Tintagel, The Garden of Fand, and the austere November Woods – take their inspiration either from Irish legend or landscape. When Bax's stock had plunged to its lowest, some of these works kept his name alive and others, notably Spring Fire, led to his rehabilitation. During the war, Bax left his wife and children for the British pianist Harriet Cohen. They were together a number of years, and after the affair had ended, remained friendly, if no longer intimate. Many of his major scores for piano came about with Cohen in mind. The Twenties and early Thirties constitute Bax's glory years. His Third Symphony inspired Ralph Vaughan Williams' piano concerto, and Vaughan Williams dedicated his Fourth Symphony to Bax. Bax always considered himself a Romantic, but he exhibited an exploratory mind. Modernism does touch him, mainly in his harmonies and in his individual approach to the symphony. He wrote seven in all, the last at the end of the Thirties. In 1937, he was knighted, which, when he considered his outspoken Irish sympathies, surprised him. In 1942, he became Master of the King's Music. However, his reputation had begun to suffer in the mid-Thirties, after the appearance of the Vaughan Williams Fourth, the William Walton First, and the early work of Benjamin Britten. He seemed old-hat, even more so after the Second World War. The titles probably didn't help in that regard. He produced fewer and fewer scores, and some have alleged he had a massive creative block toward the end of his life. Nevertheless, he continued to produce up to the year of his death, one of his last compositions being the madrigal "What is it like to be young and fair," written for Queen Elizabeth II's coronation. 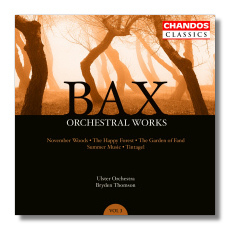 Bax's music is distinguished both by its passion and by its considerable craft. 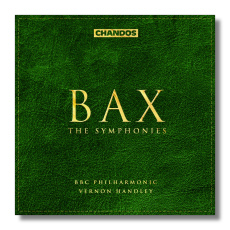 If you like late Romanticism, you will probably take to Bax, and in so doing, you will lick up a bit of gravy – a composer pushing form and idiom beyond their supposed borders. Several competing sets of his symphonies and tone poems have sprung up, and Naxos in particular has brought to light neglected major scores.